Decorating with photographs can be a lot of fun as well as a good design tool. Photos can be used in a decorative way or in a fine art way. Consider taking family photos cropping and blowing up to emphasize certain features. With Photo shop and Picasa on our computers, it's easy to do. Make your pictures fun. They don't have to be perfectly posed. Show action and it does not matter if some of the picture is not perfectly in focus! That was only George Eastman's idea. This little guy is a riot! Consider doing a gallery wall in a boring hallway, like the one on the way to the laundry room, or up the stairs! Below is another good idea.... Flank your child's artwork with pictures of him or her. The blow-up of this little girl's expressions shown in multiple ways is pure genius! Photos can be used in a contemporary way and this is a great example. Another way to use photos is more decorative. Consider having a cloth bulletin board made to match the decor. Be consistent and consider using only black and white photos of the same size, look at the effect below....decorative upholstery tacks were used to keep ribbons in place. Artwork or some type of story can be used in the center if you wish. Another decorative way to use photos is shown here as a tray, below. Now we get to the fine art part. Where do you find photographic fine art and where do you put it? I am an novice photographer and art collector and feel that fine art photography can hang anywhere you would consider putting a painting. I make no distinction. If you contact your local galleries they will usually carry a portfolio of works from the photographers just like any other artist. 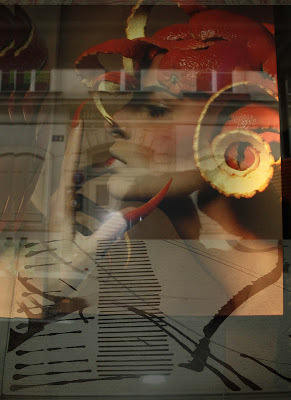 My personal style as a photographer is one of collage and human images. I enjoy color but I also like to work in sepia tones. Digital art is something new and has exciting possibilities. Have a look below and see what you think! This is a digital photo collage. It is composed of layers of "see through images". The last photo below is more "traditional" in the approach but I used sepia tones. Now you see the different ways in which photos may be thought of and where you might think to place them in your home. If you have a grouping and are unsure where to make that first hole, here's a trick. Trace each framed photo on parcel post paper, cut out and tack to the wall. Move around until you get them where you want them! Lastly, what types of frames should be used? The simple answer is, make sure they are not too decorative, keep them plain. Ikea has some great frames. You might do a whole wall in white frames or all black frames, its a great look and a great way to personalize a space.